Add foods like dark green veggies, legumes, beans, nuts, eggs, low fat dairy products and carrots in diet for healthy hair. Avoid styling your hair regularly with heat products as that can make the hair dry and dull. Changing hairstyles frequently can weaken the hair from the roots. Split ends are usually observed in long hair because the natural oils produced by the scalp do not reach the ends, therefore, making hair vulnerable to split ends. Each strand of hair is made up of two or three layers of protein. The outermost layer is called the cuticle and it protects the hair from damage. Overexposure to the sun, frequent shampooing, vigorous brushing, excessive use of dyes, relaxers and too much heat from straighteners, blow-dryers and curling irons strip the hair off the protective cuticle which results in dry and brittle ends. At the ends, the hair splits into two or three strands, and can be as long as two to three centimetres in length. A diet which is not well-rounded in terms of nutrients deprives your hair of essential nutrients required for hair health. 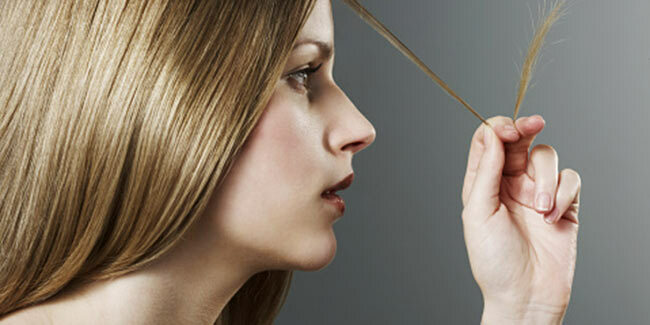 Such a diet can make your hair dry and depreive it of the natural lustre, resulting in split ends. Make sure to incorporate foods such as dark green veggies, legumes, beans, nuts, eggs, low fat dairy products and carrots in your diet. If you are one of those who always wants to look prim and proper, keep in mind that tendency to over-brush hair could cause split ends. So, it is advisable that you stop brusing your hair at regular intervals and be a little kind to your hair. Styling can make you stand out of the crowd but it often results in dry hair. There are several styling products and tools (such as dryers, curling rods, crimping irons and straightening irons) that rob your hair of the moisture, leaving them dry and unhealthy. If hair styling is unavoidable for you, just ensure that minimal harm is caused to your hair. Taking help of chemical therapies and using products for hair colouring and styling could damage hair owing to the chemicals present in them. You may think that chemical treatments and therapies are working their magic for your hair but at the same time they may be causing damage to the internal layers of your hair, resulting in split ends. You need to shampoo and condition your hair regularly for the scalp and hair to be in good health, but excess of it can dry and damage your hair. Besides, most shampoos and conditioners have chemicals in them that alter the texture of the hair to bring out the results that they promise. Constant use of hair accessories and changing of hair styles every now and then may weaken the hair and encourage split ends to form. One needs to follow a healthy hair care routine to minimise damage to your hair and remove the causes from the root.